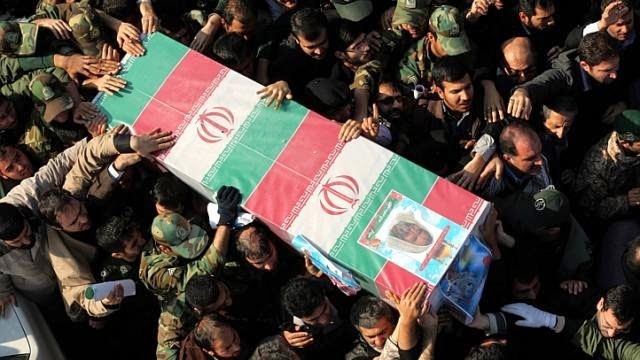 The IRGC announced the death of Gen. Taghvai on Sunday, saying he was killed in the city of Samarra by a sniper bullet. His funeral was held in Tehran on Monday. Iranian generals and all soldiers and advisers must have body armor, there are numerous photos of General Soleimani walking around the battlefield in just a casual jacket. ISIS is band of ruthless and cowardly killers and would take great pride in killing Iranians, that is every Takfiri's dream. There is no doubt that IRGC officers are brave people but they have to take proper precautions as they lead from the front. I agree,, body protection of the troops as per photos is extremely poor...especially for key figures. They can at least start wearing helmets with bullet-proof glass front and vest for key parts of the body... the quality of the vest and helmet must be good to ensure resistance against fast flying objects...there is a cost associated with this...but that cost is minimum when it comes to key figures net worth in the war. Body armour won't make a difference when you have snipers using armour piercing bullets.Even if the sniper used conventional ammo,a good sniper could simply aim for the throat or head.What ever the case this killing is but the tip of the iceberg with many more to follow. May I disagree, with good body armor you will minimize the risk of serious injury and the probability of survival. Aiming for small detailed areas instead of the entire body makes it more difficult for the sniper as well. Bear in mind Iran has "counter sniper teams" which will soon be activated in Iraq and the result will be devastating for the pretty untrained ISIL snipers. But the first step is to try to reduce the damage significantly by using proper protection. Do you know what an armour piercing round could do? Body armour is useless against it unless it's made out of inch thick solid titanium. A bit like Robocop. why should they have body armor? what's wrong with those plastic keys that Khomeini used to distribute to the kids? Can body armor not be produced in Iran ?